Lise Risom Olsen is invited to SUBTITLE European Film Festival in Kilkenny this year. The festival for european films is an unique possibility to see some of the most exciting smaller european films in the theatre. Lise will attend the networking side program of the festival. More about SUBTITLE Film Festival here. This autumn the second season of the danish TV series "Gidseltagningen" (Below the Surface / Countdown Copenhagen) is being filmed in Denmark. The series is a psychological crime-thriller in eight episodes, and Lise appears in an exciting part as a foreign diplomat. The first season received great reviews and won several prices internationally. "Gidseltagningen 2" will be released on Kanal 5 and Dplay in Denmark spring 2019. "Gidseltagningen 2" is created by Jesper Bernt, and directed by Christian E. Christiansen and Mogens Hagedorn. Producer is Morten Kjems Hytten Juhl. With: Johannes Lassen, Yasmin Mahmoud, Helle Fagralid, Søren Malling, Søren Pilmark, Elsebeth Steentoft, Ola Rapace, Henning Jensen, Laura Christensen, Flemming Enevold, Alexandre Willaume, Maibritt Saerens, Peder Thomas Pedersen, Lise Risom Olsen and others. The series is a co-production by Discovery Networks Denmark, SAM productions, collaborating with ZDFneo, Den Vestdanske Filmpulje and STUDIOCANAL. STUDIOCANAL is the international distributor of the series. Executive producers are Adam Price & Meta Louise Foldager Sørensen. The New Netflix Original series The Innocents had a London premiere on 20 August. From 24 August the series will be available on Netflix. Lise is playing Sigrid in the series, amongst colleges from UK, Australia, Island, Finland and Norway. The series is produced by New Pictures and Netflix UK. It is created by Hania Elkington and Simon Duric, and directed by Farren Blackburn and Jamie Donoghue. With: Sorcha Groundsell, Percelle Ascott, Guy Pearce, Jóhannes Haukur Jóhannesson, Ingunn Beate Øyen, Laura Birn, Sam Hazeldine, Nadine Marshall, Arthur Hughes and Lise Risom Olsen. 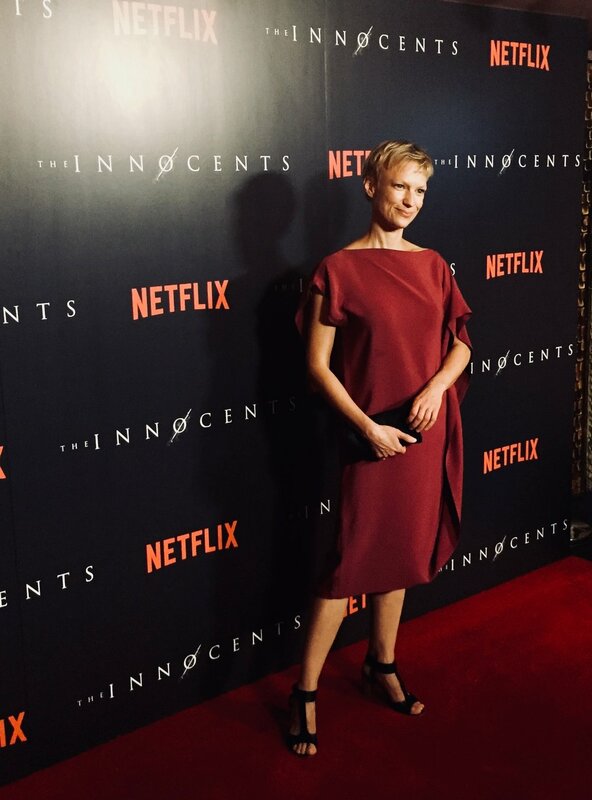 Lise Risom Olsen at the premiere of The Innocents, London 20 August. Dress by Michael Sontag, Berlin. The performance LOVE HURTS IN TINDER TIMES by Patrick Wengenroth and cast will be performed again at the Schaubühne 23 - 25 of August 2018. With: Lise Risom Olsen, Andreas Schröder, Mark Waschke, Matze Kloppe and Patrick Wengenroth. Produced by Schaubühne. Photo: Gianmarco Bresadola / Schaubuehne.